Modern styling characterizes the Divot collection. Low profile, etched opal glass has contoured bottom surface. Brushed metal details and clear, K9 glass column add to the striking design. Unique stem-hung construction carries the clean line all the way to the ceiling and, for sloped ceilings, 6 in. chain is provided to allow the fixture to hang straight and level. 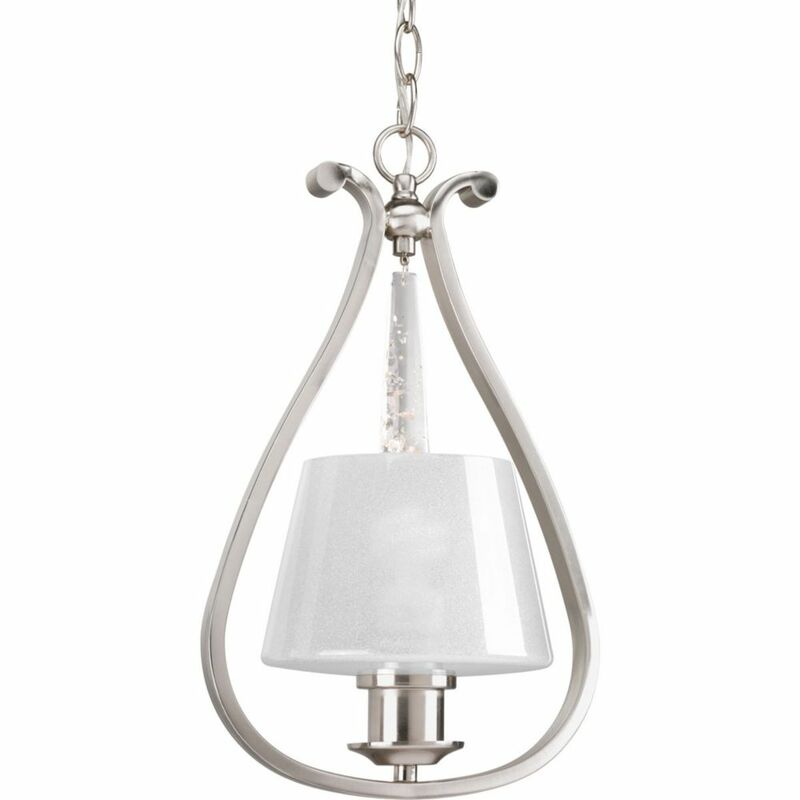 Dazzle Collection 1-Light Brushed Nickel Mini-Pendant The Dazzle collection is sure to add some wow factor to your home. Dazzling glass features a gleaming polished exterior and a interior finish composed of fused glass beads to provide diffusion and sparkle. A jewel-like, faux rock crystal adds even more panache for an elegant and well dressed effect to your home. Dazzle Collection 1-Light Brushed Nickel Mini-Pendant is rated 3.0 out of 5 by 1. Rated 3 out of 5 by TruthMatters from I'd admired this and shortly thereafter received it as a gift during a recent renovation and was ... I'd admired this and shortly thereafter received it as a gift during a recent renovation and was immediately excited with the anticipation of installing. However, what I did NOT expect was how dirty gold the plastic center accent crystal appeared. While it's depicted in advertised pictures with a nice, clean appearance, the one I received looks like a piece of plastic or resin that has badly turned...Especially hanging atop the clean white appearance of the globe. To be clear, I don't mind the crystal not being glass so much just the awful color (see all pics.) What's worse is it turns a deeper solid yellowish golden when the light is actually turned on. I shall now be forced to look for something as a replacement to hang in the crystal's position to complete the look that was already paid for. Both appearance and quality would have easily been 5 stars IF the accent crystal it arrived with would not have been so "repulsively unappealing."